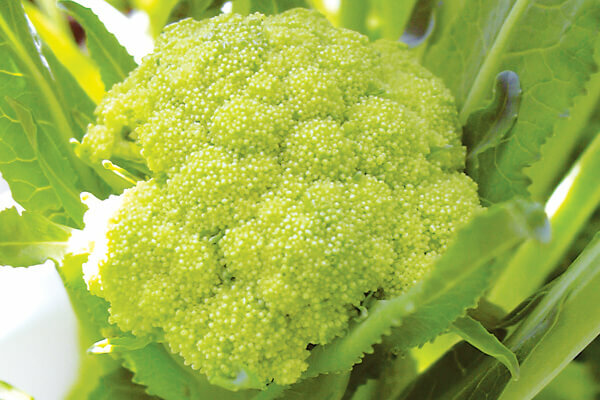 Takeaway: No longer your run-of-the-mill cauliflower and broccoli best consumed under heaps of cheese sauce, modern brassicas are colourful, flavorful, healthy, and suitable for growing in a variety of hydroponic systems. Brassicas have seen something of a revolution in recent years with new cultivars, colors, flavors, and improved nutritional value at the forefront of a growing interest in these ancient crops. Old-fashioned brassicas such as cabbage, broccoli, and cauliflower may seem a little mundane as hydroponic specimens, however, plant breeding has seen some innovative gourmet options developed that now feature in many trendy restaurants. While traditional brassica crops are fairly well-known as everyday vegetables, this family also includes a wide range of plants well-suited to different hydroponic production methods. These cruciferous vegetables include the Brassica oleracea (cabbage, cauliflower, broccoli, kale, and collard greens), Brassica rapa (Chinese cabbage, turnip), Raphanus sativus (radish), and the fiery condiments Armoracia rusticana (English horseradish) and Eutrema japonicum (Japanese wasabi). Apart from the versatility and easy-to-grow nature of most brassica types, a growing awareness of the health aspects of this diverse range of plants has seen demand rapidly increase amongst consumers and home gardeners. Glucosinolates are an important group of bioactive compounds that are found in high concentrations in cruciferous vegetable such as broccoli, cabbage, kale, watercress, wasabi, Brussels sprouts, mustard, and cress. These compounds, which are converted into isothiocyanates during food preparation, have been studied for their cancer-fighting properties as well as other medicinal activity. Research studies have shown hydroponically-grown brassicas respond well to manipulation of the nutrient solution to improve their compositional quality and levels of bioactive compounds. One example of this is with hydroponically-grown broccoli. Levels of phytochemicals with biological activity in broccoli are a result of both the genetics of the plant and environmental factors. When hydroponic broccoli plants were grown with some applied stress in the form of nutrient solution salinity (increasing the electrical conductivity (EC) of the nutrient), levels of certain bioactive compounds increased, helping to produce a health promoting food. Brassica species have considerable potential under hydroponic production. Not only can the everyday, old-fashioned cabbage, broccoli, and cauliflower be grown, but a diverse range of exotic Asian brassica species are now grown hydroponically, many of which are suited to smaller systems, NFT, solution culture, aeroponics, and even tray-based microgreen production. High-value Asian brassicas include mizuna, mibuna, komatsuna, misome, tatsoi, pac choi, kailann, and many others with flavors that range from mild and succulent to hot, pungent, and spicy. Alongside mature-sized crops, brassicas are also grown hydroponically as sprouts, microgreens, baby leaf, mesclun salad, and braising mixes as well as mini vegetables for high-end restaurants. Apart from microgreens and baby leaf, mini brassicas are a growing trend in the home garden and hydroponic market and are great for those with limited space. Mini brassicas are highly compact, often hybrid varieties that produce perfectly formed half- to quarter-sized versions which are ideal as baby vegetables with all the flavor and color of the full-sized versions. These are often sold by seed companies as “single serve” or “mini veg” and perform well in hydroponics, often with a greatly reduced time to harvest and minimal space footprint. 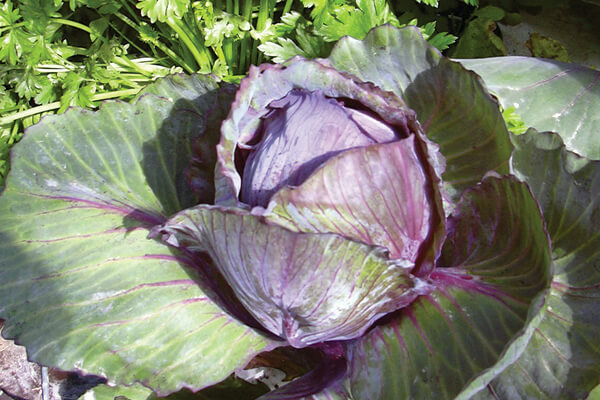 For cabbage lovers, a new mini cabbage called Caraflex is an exciting option for small hydroponic systems. This variety has elongated, pointed heads with a crisp, succulent interior perfect for salads, coleslaws, and other dishes. Cauliflower is no longer just a large white curd, buried beneath cheese sauce. The bright green Italian Romanesco, or iridescent deep purple and pastel orange varieties, make a colorful addition to hydroponic systems and are equally delicious eaten raw or cooked. Broccoli is perhaps one of the more diverse of the old-fashioned brassica crops. Nowadays, standard head broccoli has been joined by a range of broccoli types including Raab, leaf, sprouting, and Chinese broccoli — each with their own culinary uses. Sprouting broccoli, which is available as both green and intense purple types, produces many small individual florets rather than a single head. Being very tender, sprouting broccoli may be eaten raw, steamed, or sautéed and has become a popular winter vegetable. Leaf broccoli is another option well-suited to small hydroponic systems, although lesser known as a culinary vegetable. Fancy leaf broccoli types may be grown as a baby leaf salad vegetable or larger leaves grown for their sweet, classical broccoli flavor, which is a traditional specialty vegetable of southern Italy. Kale has become a popular hydroponic crop due to its diversity of types and growing interest as a healthy superfood. Unlike cabbage, broccoli, and cauliflower, which form a head at maturity, kale can be harvested at any stage and grown as a short-term crop where required. Kale grown for baby leaf production can be harvested within two to three weeks, and a number of light and dark green and intensive red/purple varieties are available. Some of the more unique kale types include the blue/green Italian Lacinato, or “dinosaur type” (Tascano) kale with elongated, heavily savoyed leaves. These types are more tolerant of the warmer conditions which may be run in mixed species indoor gardens. A number of newer, speciality brassicas are an exciting potential for hydroponic growers. These include flower sprouts, which are the result of breeding crosses between Brussels sprouts and kale. These produce colorful rosettes of leaves in shades of green, red, and bicolor that develop on the sides of stalks of upright plants in a similar way to Brussels sprouts. Flower sprouts have a unique, tender flavor (similar to kale) and have developed a niche market as a gourmet veg. Asian and mustard green brassicas include a range of Chinese and Japanese species growing as specialty vegetables. Mizuna and mibuna are common salad mix ingredients while others such as misome and tatsoi produce compact, Asian greens more commonly used in cooked dishes. Pac choi (bok choy) is one of the most widely recognized Asian greens with a mild mustard flavor and, for hydroponics, the mini versions — six inches at maturity — perform particularly well. Asian mustard greens consist of many different leaf types which are often savoyed, may be light or dark green or intense purple with a hot, spicy flavor. Mustard types are more commonly grown as baby leaf or microgreens in hydroponic systems for both their attractive foliage and distinctive flavor. Watercress is one of the oldest known leaf vegetables consumed by humans and in more modern times, perhaps the most commonly grown commercial hydroponic brassica crop. Watercress is well suited to solution culture and grown for both baby leaf and full-sized production. With its peppery, piquant flavor, exceptional nutritional value, and rapid growth rate, watercress is one of the easiest hydroponic plants to grow and takes up little space if kept well-trimmed. Watercress plants can be started in hydroponics by simply buying a fresh bunch and inserting the lower stem end into a container of nutrient solution or straight into anNFT channel. Roots rapidly develop from the stem nodes and new plants will be growing fresh foliage within a week or two. Watercress can also be started from seed, scattered onto the top of rockwool cubes or damp growing substrate for later planting out. While watercress prefers a flowing nutrient solution, it can also be grown in static raft or float systems with nutrient levels similar to those required by lettuce. Radish, turnip, and kohlrabi are underutilized crops that grow prolifically in shallow substrate-based hydroponic systems. The common radish now comes in a diverse range of shapes, sizes, colors, and pungency with modern hybrids being incredibly quick to grow (21 days to maturity) for small salad types. The large, white daikon radish, a staple of Japanese cuisine and also grown for the production of kimchi, produces spectacular-sized specimens under hydroponic nutrition and makes a unique addition for a mixed garden. Baby turnips and the lesser known kohlrabi add diversity to a mixed vegetable system and can all be grown together on the same nutrient formulation. 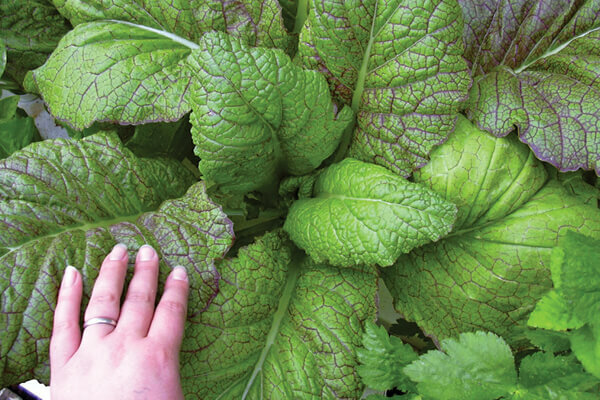 Smaller brassicas such as many of the Asian greens, baby leaf and mini types, watercress, mustards, and kale are well suited to NFT, aeroponics, and solution culture such as raft or float systems. These are generally compact, fast-growing plants that can be harvested young before extensive root systems develop. The larger heading brassicas such as broccoli, cauliflower, cabbage, or Brussels sprouts and root crops can be fairly large plants at maturity and are more suited to media bed, bag, or container systems with drip irrigation. Suitable substrates include coconut fibre or perlite which have both a high moisture holding capacity between irrigation as well as being sufficiently aerated. Shallow trays or media beds can also be used to produce kohlrabi, baby turnips, and quick-growing radishes. Most brassicas will happily intercrop with a wide range of other plants in mixed hydroponic systems including lettuce, herbs, and other vegetable crops. General purpose vegetative nutrient formulations are fine for most brassicas with an EC in the range 1.8-2.2 and pH of 5.8-6.2. If a dedicated brassica-only hydroponic system is set up, nutrient solutions can be modified with additional sulphur specifically for these crops. Brassica crops derive much of there distinctive flavor from sulfur containing compounds called glucosinoles. Manipulation of sulphur in the nutrient solution can help boost these flavors which range from cabbagey to peppery. Increasing sulphur levels in hydroponics have also been shown to assist flavor or pungency in brassica condiment herbs such as wasabi or horse radish, which contain mixtures of volatile compounds such as isothiocyanates which give them their flavor and heat. Brassica crops are fairly flexible when it comes to temperature conditions — selection of either summer or winter varieties of cabbage, for example, allows growers to choose those most suited to the environment of the indoor garden and other species these may be grown alongside. The general range for most brassicas are temperatures in the 54-79°F range with a moderate level of light. Avoidance of temperatures over 79°F helps prevent one of the main issues with many brassica crops — bolting, which is the premature formation of a flowering stem. Bolting is characterized by the upwards elongation of the plant and loose formation of leaves inside cabbage, or early flowering in broccoli. Brassicas are one of the most diverse families of nutritious, healthy vegetables consisting of traditional, long-standing types such as cabbage and the newer speciality niche markets versions created by modern plant breeding. Many of the smaller brassica types are well-suited to being incorporated into a mixed species hydroponic system where space is limited and most produce rapid growth rates in a protected environment. Experimenting with some of the more non-traditional hydroponic crops such as radish, kohlrabi, kale, and flower sprouts is a great way of increasing diversification in an indoor garden as well as producing some fresh, highly nutritious veg for the kitchen.